When Joe Namath famously guaranteed that the New York Jets would beat the Baltimore Colts in Super Bowl III, no one could believe it. After all, the Jets were eighteen point underdogs. Yet, as he predicted, the Jets did win leading to one of the most iconic moments in football history. As Namath ran off the field, he raised his right arm and waved one finger celebrating the fact that he had won. That single picture proclaimed victory and triumph. On the cross, Jesus had come to the end. His death was seconds away. But before He breathed His last, he managed to proclaim a word of triumph – tetelestai. This one word announced His victory. In English, we translate it as “It is finished” and it announced the work of redemption was done and Jesus had triumphed. God’s plan of redemption didn’t begin at the cross. It didn’t begin in Pilate’s court or in Bethlehem. It didn’t begin in Babylon or Egypt or in the Garden of Eden. The Scriptures tell us that God’s plan of redemption began in eternity past (Ephesians 1). Now, with that said, God’s plan did unfold throughout history. God moved through the events of history, calling Abraham, delivering the people of Israel from captivity in Egypt, providing a king, preserving a remnant, becoming flesh and dwelling among us, living, dying, and rising again. But, let’s focus on the provision of the sacrifice and the role it played throughout that history. We see the first sacrifice in the Garden (Genesis 3:21). But, just a few verses before that, there is a promise of One who will come and put an end to Satan, sin, and death (Genesis 3:15). As we move forward, the children of Israel have been relocated to Egypt, eventually enslaved, and then delivered under the leadership of Moses. During the Exodus, God comes to them and gives them the instructions for how they are to live. And, in doing so, He gives them instructions on a variety of sacrifices (Leviticus). These sacrifices were largely to be offered as a way to deal with the sins of God’s people. These sins had to be covered. God’s perfect righteousness…His holiness abhors sin. He cannot tolerate it. So, it must be atoned for…paid for through sacrifice. For hundreds of years, the blood of bulls, sheep, and goats brought temporary covering. It is said that Buddha’s dying words were “strive without ceasing.” What a striking contrast with “It is finished.” These phrases clearly define for us the difference between religion and its endeavors to make oneself right with God and with Christianity. Simply stated, the difference between the two is two simple letters. The difference between religion and Christianity is the difference between do and done. They say brevity is the soul of wit. If that’s the case, the apostle John should win a prize for 2 John. At only 245 words in Greek, it is the second shortest book in the New Testament. Despite its brevity, John packs a great deal of insight into these thirteen verses. His letter begins the way most letters began in his day. John identifies himself as the “elder” and the recipient of his letter as “the elect lady and her children.” Commentators differ as to whether or not John is writing to a church and its members or a lady and her family. It makes little difference for our purposes here because we are focussing on what John says to his recipients. John says he loves these individuals (whomever or how numerous they are) in the truth. Not only that, but all who know the truth love them as well. Truth is more than a philosophical concept. It is a theological one. Jesus identifies himself as the truth (John 14:6). Furthermore, He identifies God’s Word as truth (John 17:17). The truth of Christ and His Word, the truth of the gospel, unites us as believers. In essence, John is saying that as believers, we know the truth. And, as believers who know the truth, we love other believers who love the truth. In a world filled with so much division, there is no room for it in the church. We can disagree. We can be diverse. But we must not be divided for Christ has bound us together. Jesus is the One who unifies us. It is in Him and through Him we love all who are in Him, regardless of whatever other differences we may hold. We are one in Him. We are one in His Word. We are one in the gospel. All who know Him love those who know Him. So, if we are in Christ, let us strive by His grace and His power to love those in the truth. Let us love our brothers and sisters in Christ, whatever our other differences may be. We see throughout Scripture the importance of prayer. It is called for and modeled by Old Testament saints and prophets alike. Likewise, Jesus not only calls us to prayer, He also teaches us to pray and models for us a life of prayer. The early church was filled with praying believers. So, with that said, let’s take a moment to look at some simple steps that can help strengthen our prayer lives. Establish a time and place so you can get alone and eliminate distractions. It’s best if we can carve out some time each day to spend alone with God free from distractions. So, find the time that works best for you. People are seen praying throughout the Bible at different times and in different postures. God is more concerned that we spend time in prayer than what time we pray and He’s more concerned with the posture of our hearts than our bodies. Whatever hour might work best in your life, set it aside and make it a priority. Turn off the television and put your phone away. Try to eliminate as many distractions as possible so you can spend some time connecting with our Heavenly Father. Remember that prayer is communication. It’s a conversation with God. For many of us, we try to find a balance between conversation and reverence/respect. Because we do, we tend to drift into “prayerspeak.” Through the years I’ve heard many people talk one way and then pray another. It’s like they’re speaking an entirely different language. Try to avoid this. As you pray, spend some time in silence. Allow God to stir in the stillness of the moment. It’s often in our quiet moments of reflection that God brings things to our mind to challenge and comfort us. Speak openly and honestly with God. Don’t try to impress Him. He knows our feelings and emotions. He knows if we’re afraid or anxious. He knows if we’re angry. Acknowledge to Him and ask Him to help you move through those feelings. When we read the Psalms, we see the struggles of the psalmists. We also see the struggles of the prophets as they confessed they didn’t understand what was going on around them. Let’s strive to avoid the dangers of pretentious praying (Matthew 6:5-8). As we do this, it is helpful to remember that the Spirit prays with us and for us (Romans 8:26). If we’re honest, we know that sometimes our prayer life becomes stale. We run out of things to say or we just repeat the same things over and over. Here are a few suggestions that can help us move beyond this. Pray Scripture, particularly Psalms – Donald Whitney has written a marvelous book on this entitled Praying the Bible (as a matter fact, anything by Donald Whitney is worth reading). Perhaps it might help you to write our your prayers or to record them in a journal. You can do this in a hard copy or digitally. Day One, Evernote, OneNote, or any word processor (Word, Pages, Google Docs) can be a great tool for this. Learn to pray without ceasing (1 Thessalonians 5:17). Take advantage of the moments here and there and pray whenever something…or someone comes to mind. Prayer walking. Walk through your neighborhood praying as you go. This is a great way to pray for the people around you. Pray 4 Every Home is a great resource you can use in this endeavor. Whatever method or plan, time or posture, tool or resource, the important thing is to pray. So, spend some time today connecting with God through prayer. We all want to grow in one way or another. And, many of us look at the new year as an opportunity to make a some changes in our lives. So, with that said, it seems like a good time offer a few suggestions to help us grow in our spiritual walks. A great place to start deepening our relationship with God is by spending time in His Word. We know that the Scripture provides what we need for spiritual growth (2 Timothy 3:16-17). In the pages of the Bible, we learn about Jesus and the plan of redemption (Luke 24:27). We learn how we need to live and move forward in life (Psalm 119). We grow in the grace and knowledge of the Lord (2 Peter 3:17-18). We learn to distinguish truth from error and we see more clearly the areas of our lives that need changing (Hebrews 4:12). First thing to do is to get a Bible. By that, I mean get a Bible you will use. Get one with print big enough you can see. Get one you can understand. There are a number of really good translations available. I usually recommend the English Standard Version (ESV) or the Holman Christian Standard Bible (HCSB). In addition there are a number of digital options that are good as well. Olive Tree, YouVersion, and the ESV app are all great tools you can use on your phone or tablet. Furthermore, you may find a study Bible a helpful resource and once again the ESV Study Bible or the HCSB Study Bible are hard to beat. Second, get a plan. You can find a number of reading plans tailored to your goals. You can read the Bible through in a year or over the course of two years. You can read the New Testament through in a month or two. There are no limits to the suggestions. A month or so ago, Justin Taylor wrote about a number of great options on the Gospel Coalition Blog. Third, set a time where you can minimize distractions and invest your time in reading. Find the best time for you whether it’s morning, evening or late night. To start, the length of time is not as important as the consistency. Fourth, pray to seek the Lord’s help in understanding and applying what you read. The Holy Spirit is our helper as we spend time in the Word (John 16:13; 1 Corinthians 2:12). Fifth, read. As you read, interact with the text. Ask questions like who, what, when, where, why, and how as you move through the text. Underline things and take notes. Jot down your questions, observations and insights. Converse with others about your readings, including your questions and insights. Get their input and seek their prayers about what God has laid on your heart. Finally, live out what you learn. 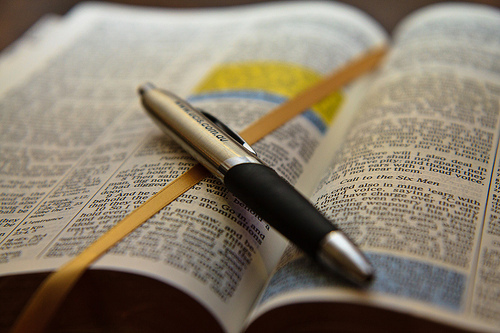 Reading the Bible is not primarily an intellectual exercise. By God’s grace, we are to apply the things we’re reading to our lives every day.